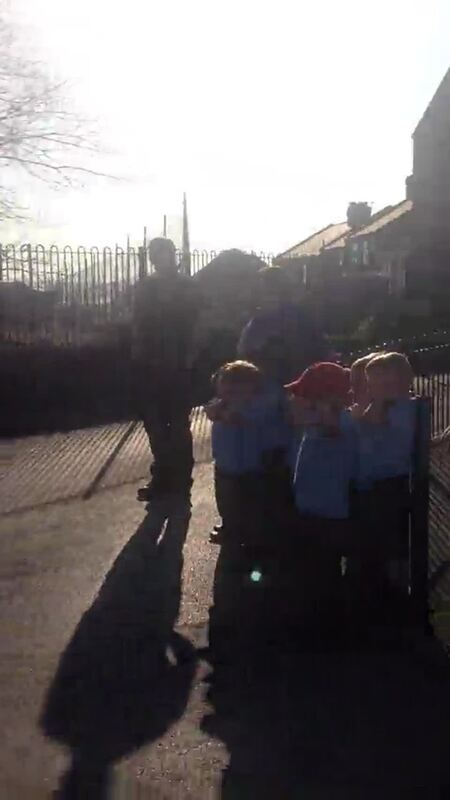 As the weather is starting to become warmer, please ensure your child brings a sunhat and a water bottle to nursery. 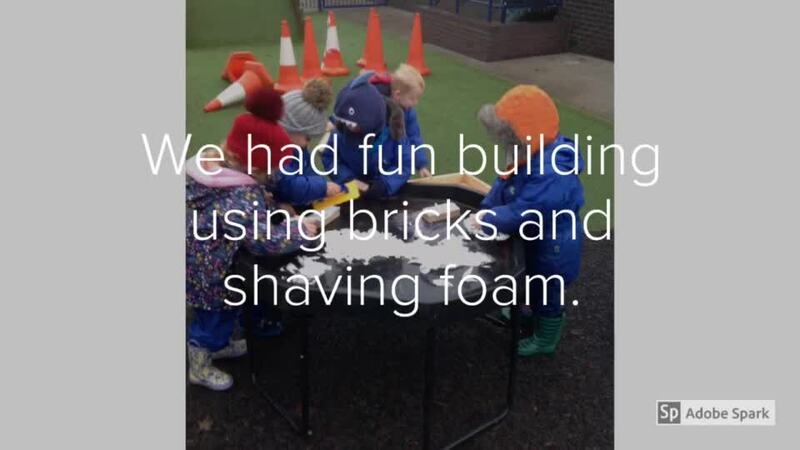 We learn through a range of planned activities, child initiated play, adult led play and accessing the continuous provision available both in the indoor and outdoor learning environment. A calm and caring environment is what we aim to provide focusing on building positive relationships, resilience and independence. Below is a poem written by Anita Wadley called 'Just Playing'. 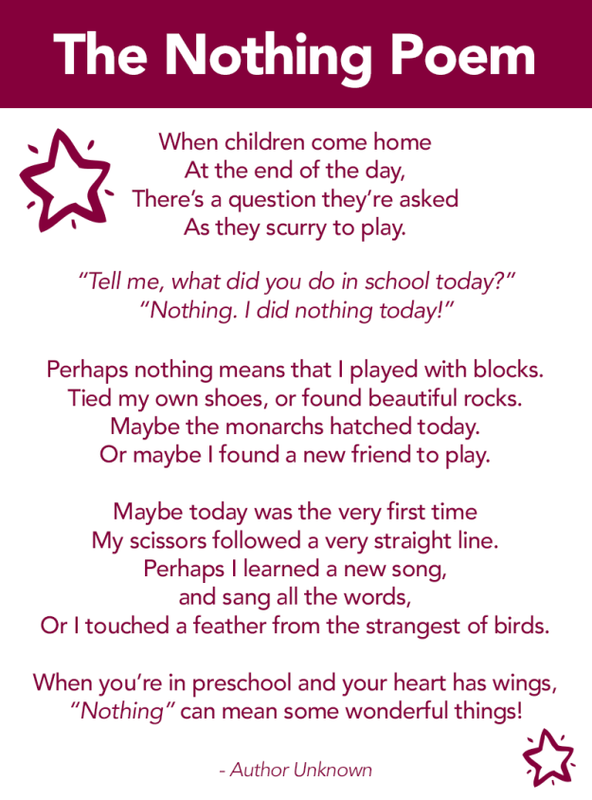 It is a great poem that highlights the importance of play for young children. We have started to prepare our wooden bicycle ready to be decorated next week. The children in nursery will also be creating bunting that will be displayed in Mapplewell to celebrate the Tour De Yorkshire 2019. Well done to all children who have entered the egg competition, all the eggs are brilliant. The winner will now be announced on Monday. 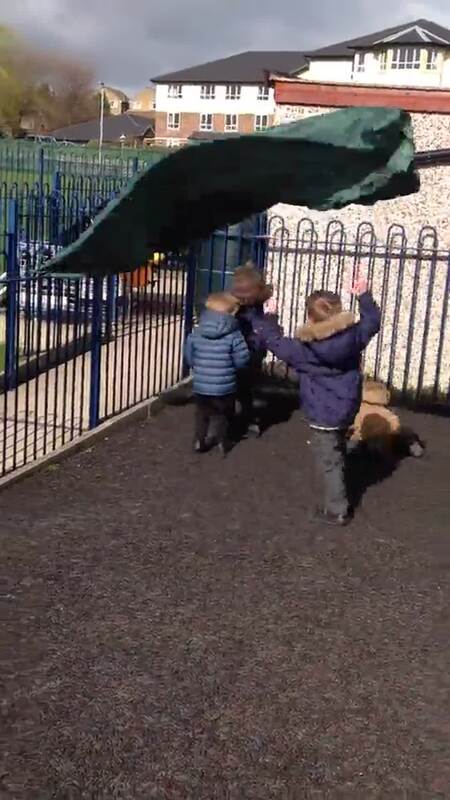 The weather has been warm and sunny this week and the children have enjoyed having fun in the sun. We spoke about how when the weather is warm we might need to wear different clothes and that we must drink water from our water bottles to keep us hydrated. When you are out and about this weekend look out for signs of Spring that you can share with us at nursery next week. We have been exploring large scale mark making on the floor using a roll of white paper and pens. We have been drawing transport from our key story 'We all go travelling by'. This week we have been looking at different forms of transport and sorting them into groups. Some children sorted the transport depending on which they liked and which they didn't like, some children sorted the transport depending on whether they had wheels or not, and some children sorted the transport on where they travel. Nothing like a Crab dance to finish a Friday afternoon. This week we have been working in pairs to order the Numicon shapes from smallest to largest and using the names for each Numicon shape. We then closed our eyes whilst Mrs Travis removed one of the Numicon shapes and closed the gap in the number line. It was tricky to spot which Numicon shape was missing but some children realised that if they counted up the Numicon line starting from 1 then they could work it out. 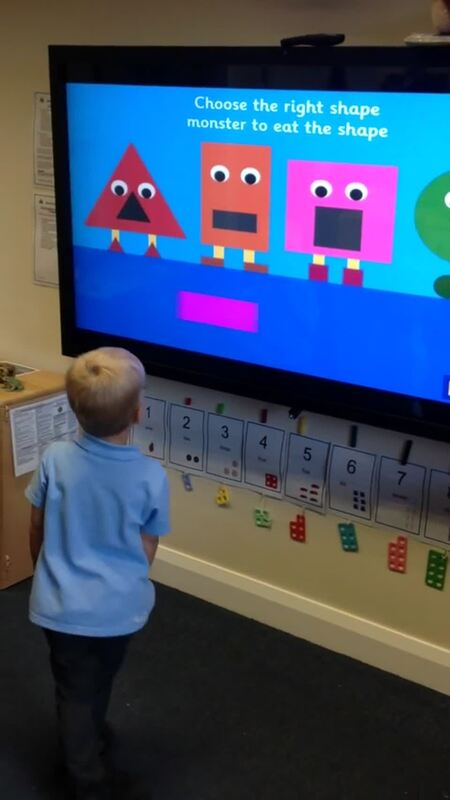 The children then had to work together and put the Numicon shape back into the correct position in the number line. The boys in the afternoon session though it was funny to 'telephone' each other using their bananas. It was then suggested that they write numbers on their bananas so they can dial the number of their friends. This sparked some brilliant mark making and conversations around number. It has been such a windy week! The boys in the afternoon session are showing great fascination with crabs. This afternoon Tyde brought in the shell of a crab that he had eaten for his lunch. "We bought it from the market then we ate it then we put it back together again" explained Tyde. 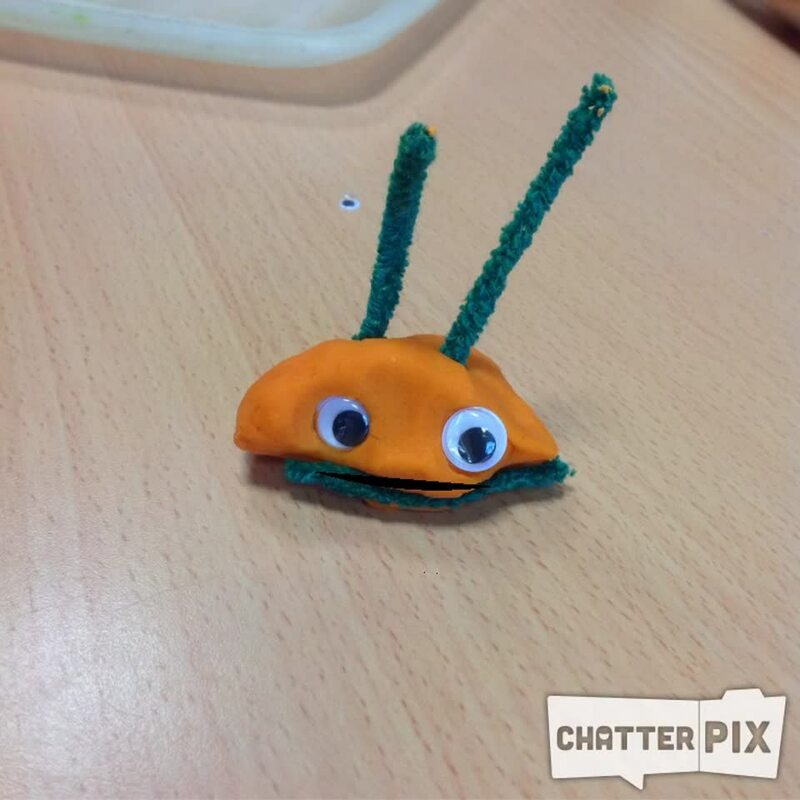 The rest of the class were fascinated by the crab and enjoyed holding it and feeling its hard shell and bumpy body. "It has a shell to stop it getting eaten by the other animals" explained Arran. "It's like a tortoise" said Noel. "It's got 1,2,3,4,5,6,7,8 legs" counted Tyde. We then used the Interactive whiteboard to look at pictures of other types of crab. We watched a video of a crab move along a beach and dig a hole using its legs. The boys then tried to move like a crab around the classroom and thought it was extremely funny! This week we are looking at drawing figures. We have begun by drawing ourselves thinking carefully about the shapes we needed to draw. We used a mirror to look at our face to help us to draw this in detail. The pictures that have been created are super. 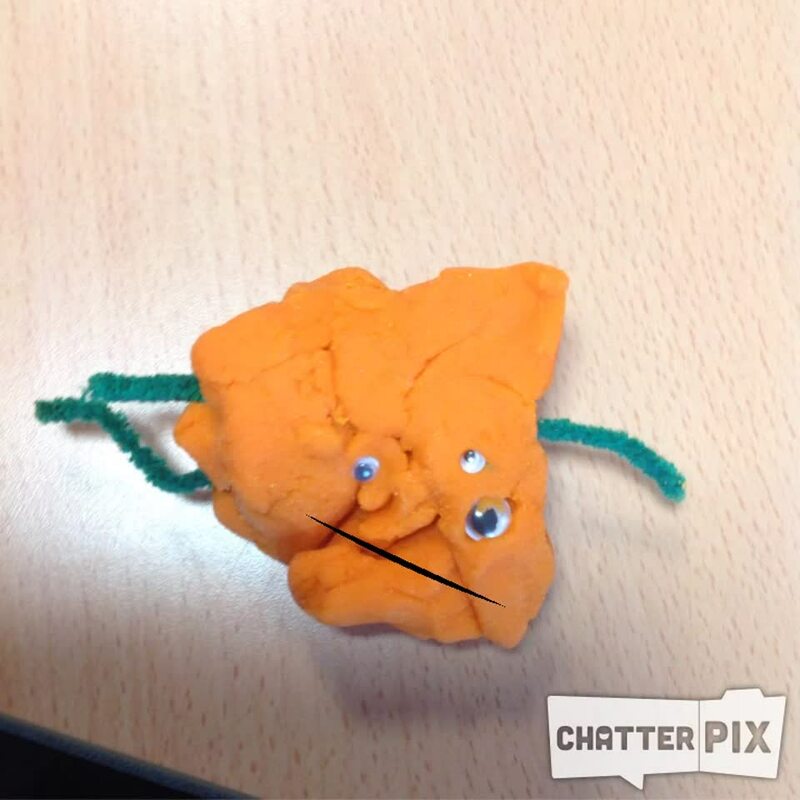 The children are exploring different ways to use natural materials in the play dough. We have looked at the different patterns that can be created, and made lots of birthday cakes. 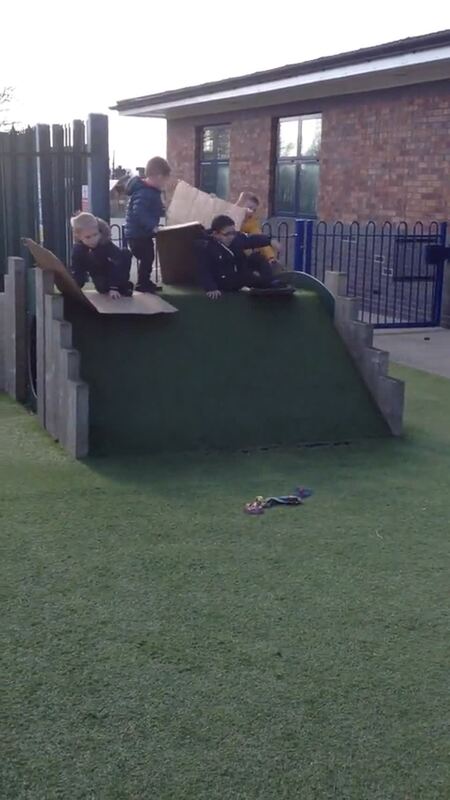 This week in the outdoor area we had large cardboard boxes to explore, it wasn't long before the children worked out that they could slide down the hill faster if they sat on pieces of the cardboard. This week the small world area has been moved to create a large space for the children to explore using the small world and construction materials. 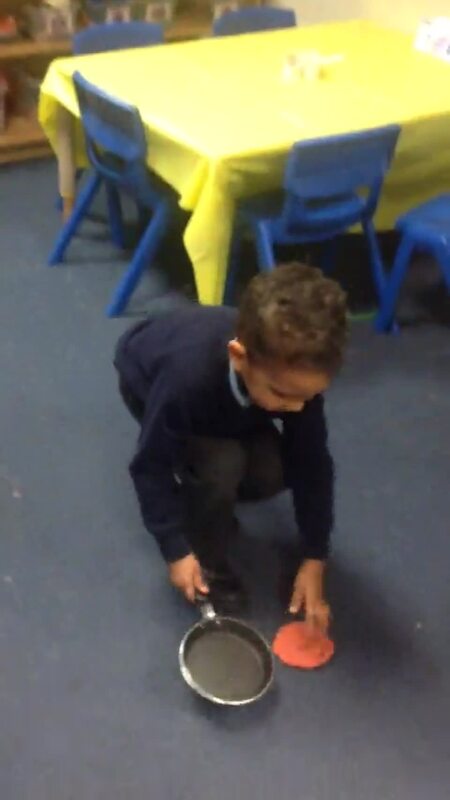 It is great to see how the children are accessing the areas in different ways. The children have really enjoyed accessing the construction area this week where they have been building on their creative skills and imaginative play. World Book Day was so much fun, the children's costumes were fabulous! Each child told us who they were dressed as and clearly shared something interesting about their character. Today was pancake day, we tasted pancakes with syrup and with lemon juice. 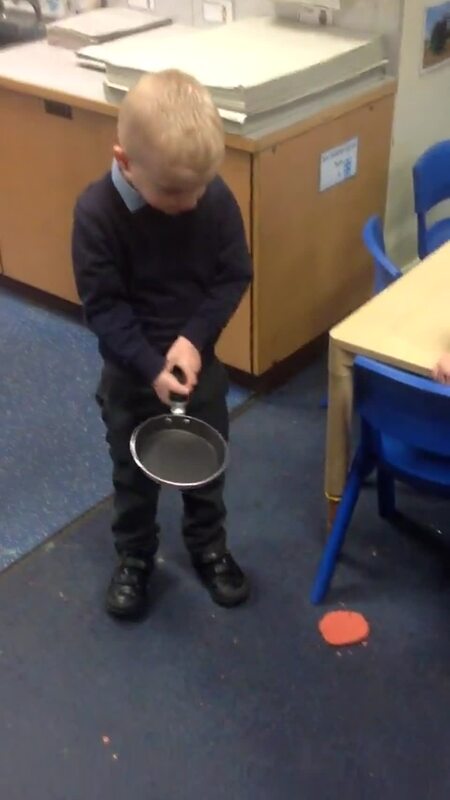 Most of the children preferred pancake with lemon juice but some children said they liked the syrup the best. 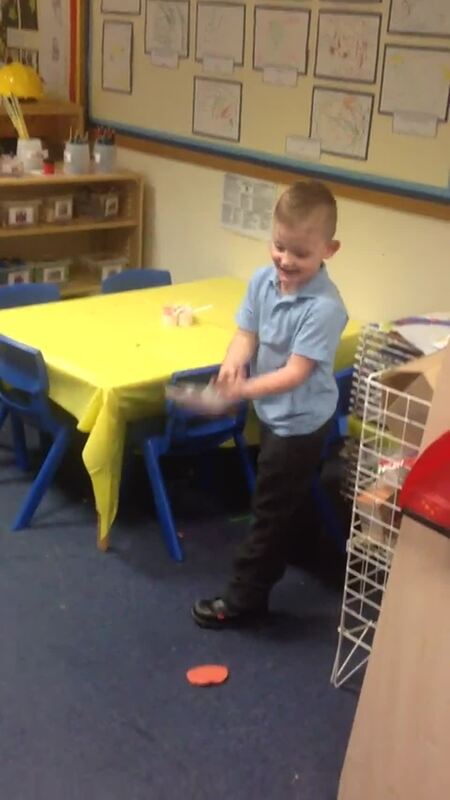 We then made our own pancakes using play dough and tried to toss the pancakes into the air and catch them back in the frying pan. It was fun but quite tricky. This week in literacy we are developing our listening skills to help us hear the initial sounds in words. We have been playing the game "I spy with my little eye, someone beginning with ..."
Some children have been helping Teddy pack a bag for his trip away, but only putting in objects that begin with specific sounds given by Teddy. e.g. "Can you pack me something that begins with the sound 't'?" Teddy has also been introducing the younger children to the eight key nursery rhymes and their actions from the rhyme bag. 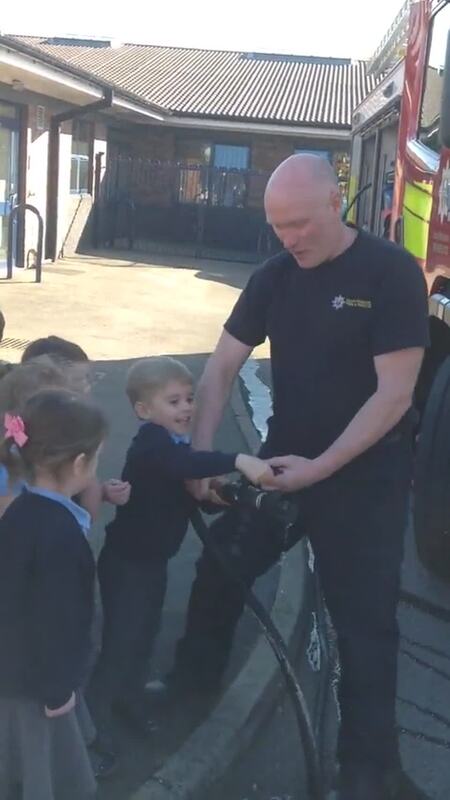 This week the children in nursery were lucky enough to have a visit from a fire engine. The firemen told us all about the fire engine and showed us special parts of it such as the hose and the long ladder. 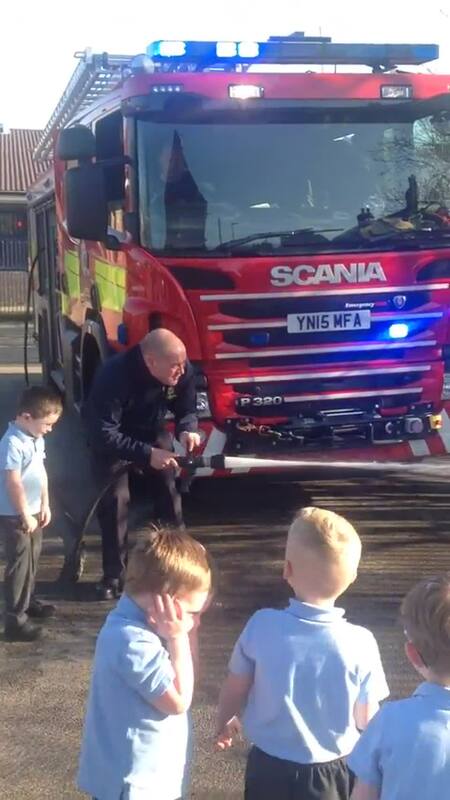 The firemen showed us how they use the hose and fire engine sirens, which were very loud! We all really enjoyed our visit from the fire fighters and their fire engine it was a brilliant experience for us. Our topic for Spring Term 2 will be 'Transport'. We will be looking at different types of transport and sharing our experiences of transport and travel. Alongside transport we will also be exploring the signs of Spring that are visible around us and discussing these. Our Key Story this half term will be 'We all go travelling by'. What a fantastic half term we have had in Foundation Stage 1. The children have thoroughly enjoyed learning all about people who help us and we have been lucky enough to have a wide range of visitors from our community come in and speak to us about their different roles. Who is special to us? As it was Valentines Day this week we finished the week by thinking about who is special to us. This week we were lucky enough to have a visit from David who volunteers for Mountain Rescue. He told us about his job and how he helps people. David showed us photographs of a flood where he used boats to transport people to safety. He brought in his life jacket and hat which the children enjoyed trying on. David's hat was hard to protect his head and it had a bright light on it to help him to see. Thank you David for teaching us about your role and how you help people! A visit from Crime Scene Investigators. Yesterday we had a special visit from two Crime Scene Investigators. They spoke to us about some of the things that they do in their job. We had a look at some large photographs of a fingerprint, and a footprint. Officer Glynn asked us to look carefully at our fingers to see if we could see small patterns on our fingertips and thumbs. Officer Glynn and officer Fiona set up three activities where we could all explore different ways of making our own prints using our hands and feet. Some children had some wonderful patterns on their shoes. Officers Glynn and Fiona then showed us what they must wear when they are working, the children thought it was a very funny costume! It was good fun trying on the white suits and hair nets. Finally, Glynn and Fiona then showed us a brown paper bag, not just any brown paper bag, a HUGE brown paper bag! Officers Glynn and Fiona explained that they put objects inside the bag to take them to the police station. The bag was so big we could use it as a tent! We had super fun with the CSI team. Thank you very much Glynn and Fiona. This week we have been talking about Chinese New Year. 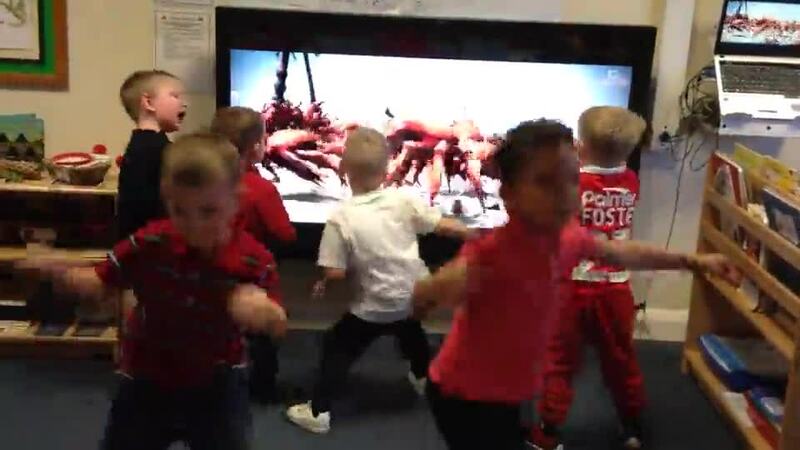 We learnt about what some families might do as they celebrate Chinese new Year and we watched some dragon and lion dancing on the interactive whiteboard. We also explored Chinese writing and attempted to copy some patterns using different lines. If you were going on a bear hunt what would you see? Look at all the numbers in nursery today! It was great to hear the children telling each other which numbers they had on their clothes. 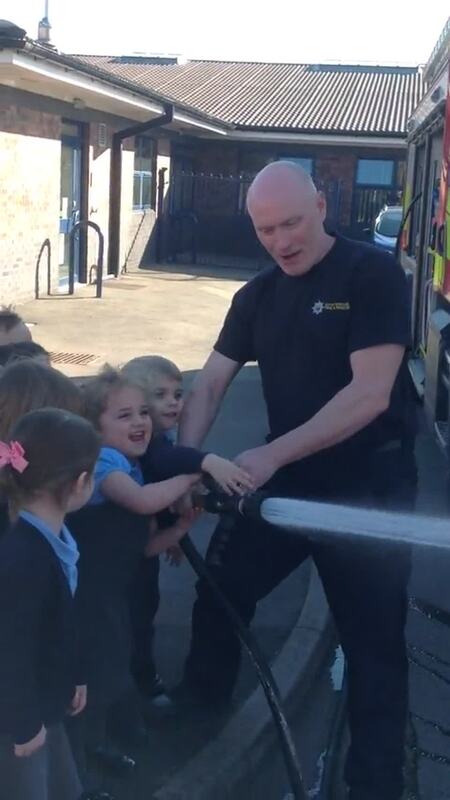 Today Fire fighter Matt came in to speak to nursery children. He told us about all the different jobs that firefighters do. Matt also showed us his uniform and what he has to wear to keep him safe when he is working. Matt also brought in a smoke alarm to show us and spoke about how important it is to have them in our house. Today we had a visit from Police officer Sarah. She came into nursery to speak to us about how police officers keep us safe, and how we can keep ourselves safe when we are out and about. 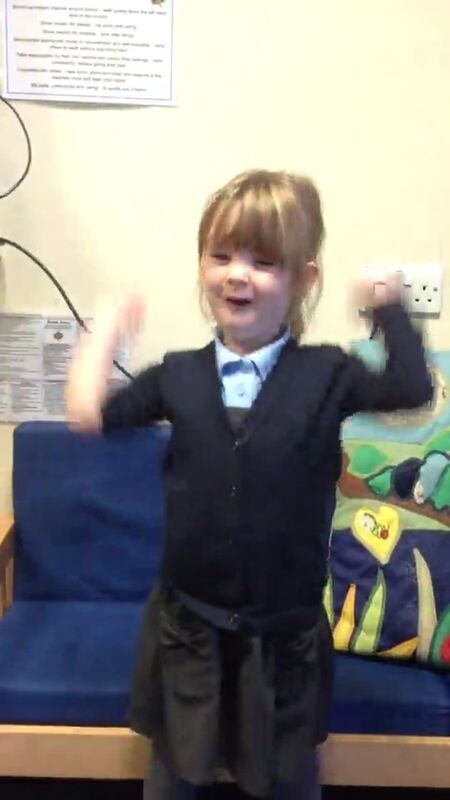 Sarah taught us the Makaton sign for 'Police Officer' - Can you remember this sign? Today the Lollipop ladies Mrs Lawrence and Mrs Benson came into nursery to visit us. They told us all about their job and how they keep us safe. We discussed our experiences of crossing with the lollipop ladies and how we need to wait patiently until they say it is safe to cross, then we walk sensibly across the road. We also talked about why their coat was so thick, waterproof and so bright! "I know that's so the light it bounces off their coat and we can see them, its called reflective" explained Arran. Some of us noticed that on the lollipop lady's sign there was a word and a picture. We discussed that the word said 'STOP' and why it might need to say that. "You stop the cars to cross us and I can see words" stated Charles. "I can see a girl and a boy" said Neeve. "It's so we don't get run over" added Francine. Thank you Mrs Lawrence and Mrs Benson for coming in to speak to us we really enjoyed having you in nursery. 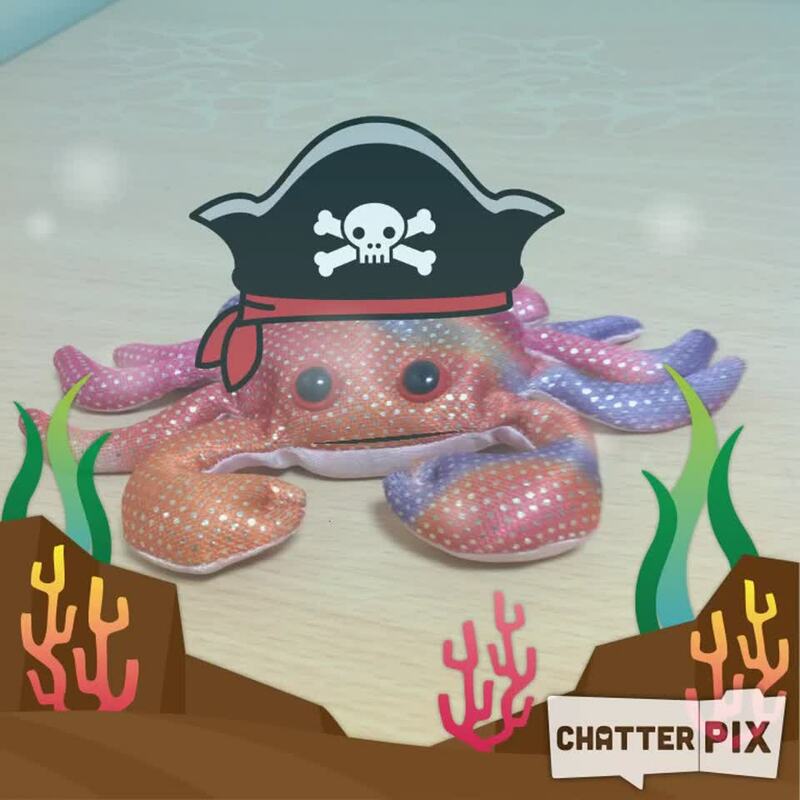 The children in an afternoon have been using the app Chatter Pix to make objects and toys in nursery come alive and sing our favourite songs! What happens when you mix the colours red and yellow together? This week the nursery children have been exploring colour through provision. 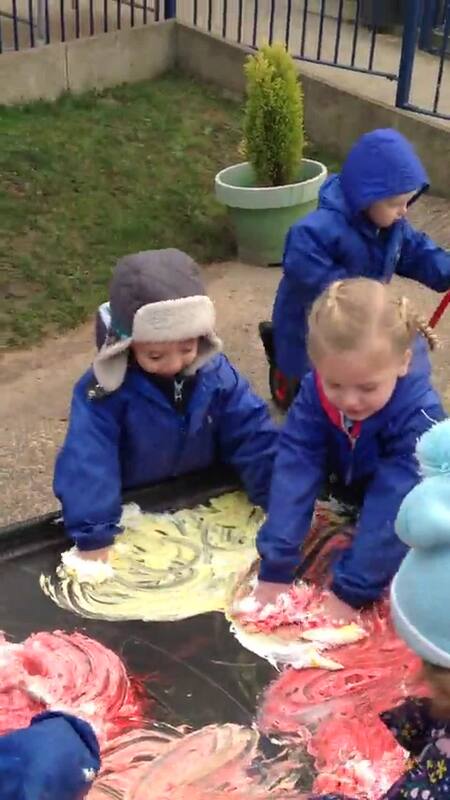 Outside we mixed red and yellow powder paint with water using paint brushes, then we sprinkled different powder paints on to white bubbles that we made using large sweeping brushes and washing up liquid. As the children have had their milk in cups with straws this week they have shown an interest in blowing bubbles, so today we blew bubbles into a mix of paint, water and washing up liquid, we then placed a piece of paper over our bubbles to make bubble pictures. 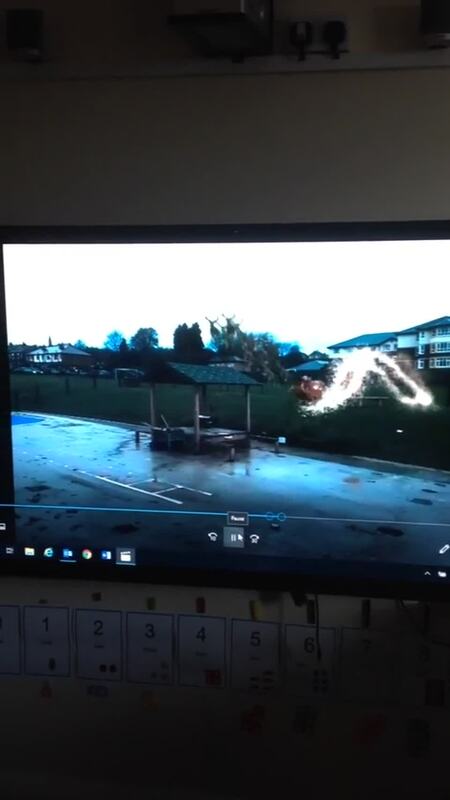 Today we heard a jingle of bells outside, when we checked to see what it was we discovered that a special visitor was flying over our early years playground! We then heard bells again and a voice saying "Ho Ho Ho", suddenly in came Father Christmas! He told us that he had landed his sleigh on the school roof and his reindeer were waiting for him. Father Christmas spoke to everybody and gave us all a present. He then wished us all a Merry Christmas and went back to his sleigh so he could fly back to the North Pole. On Wednesday it was Christmas concert day. The morning children sang to their parents in the nursery classroom and the afternoon children sang on the stage to all parents in the Key Stage One Christmas concert. Mrs Travis and Mrs Moore were very proud with how well the children sang in front of an audience. Well done Dragons you are super stars! 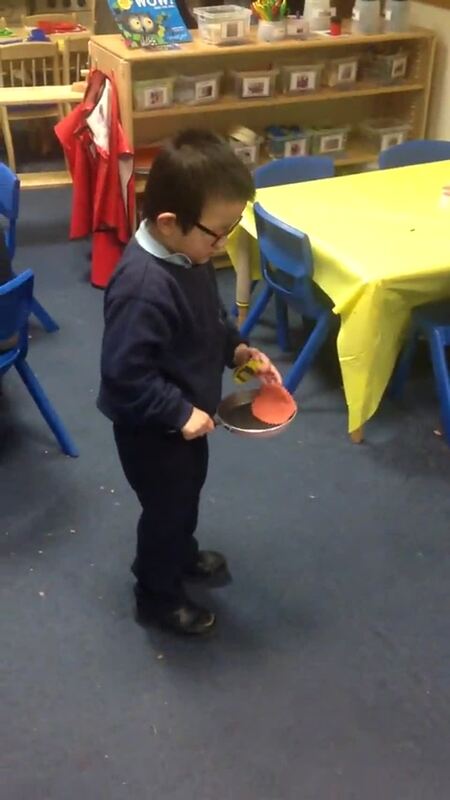 The children had a super Christmas party on Monday. There were party games, Christmas crackers and lots of dancing. This afternoon the boys were enjoying creating and flying their paper aeroplanes, so we decided to put up a target for them to fly their aeroplanes through. 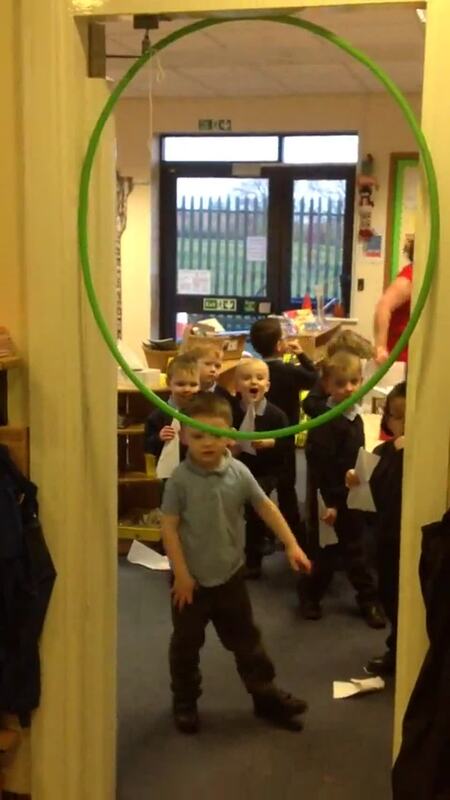 It was super fun and good for developing our gross motor skills and co-ordination too! This morning was very cold, when we played out we needed to wear our coats, hats, gloves and scarves to help keep us warm. We noticed that the grass was frosty and white, when we stood on it we made footprints. Evelyn and Neeve then discovered that the benches a were covered in frost and that they could draw pictures in the frost using their fingers and the animals. We managed to scrape the ice into small piles. "I'm going to take this ice home" said Emily. "No it will melt with the sun" replied Neeve. Emily watched as the ice meted on her hand. "Look it has gone!" she said. It was fun exploring ice and its properties. "Its so freezing" exclaimed Charles. We have been practising our scissor skills this week by snipping Christmas beads. The children in nursery have been working very hard to create their Christmas cards. They look fabulous and are being displayed in the nursery classroom. The toy catalogues are very popular this week in nursery, there is wonderful speaking and listening happening as the children share their ideas and thoughts with peers, even some super mark making too! The great thing about rainy weather is the puddles it creates for us to splash in. 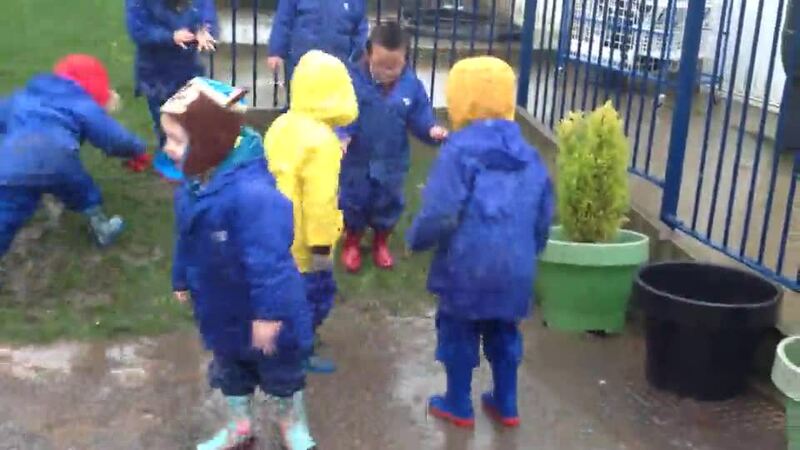 The boys in the afternoon session discovered this puddle and enjoyed creating the biggest splashes that they could. This week we looked at the patterns of the Numicon shapes up to 6. We practised counting out different amounts of Numicon pegs onto a base board, then checked our answer by placing the corresponding Numicon shape on top of the pegs. 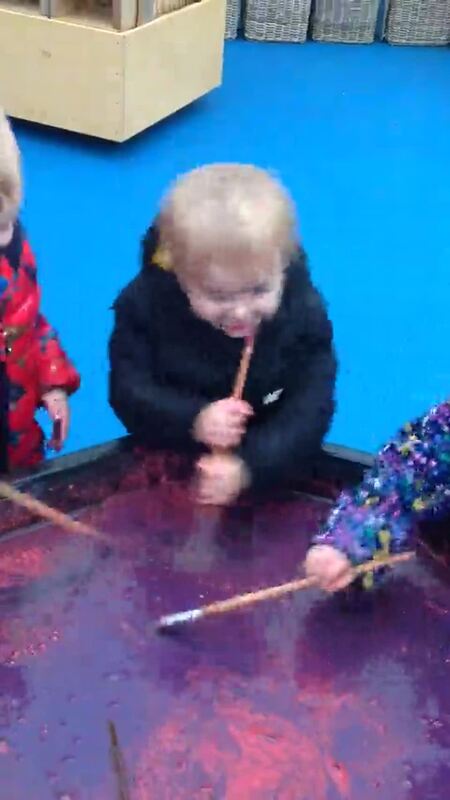 The children are showing an interest in mixing colours, so today we mixed red powder paint and blue powder paint into rain water that had collected in a 'tuff spot' outside. "It's all purple!" said Charles. It was fun and great for our gross motor skills too. 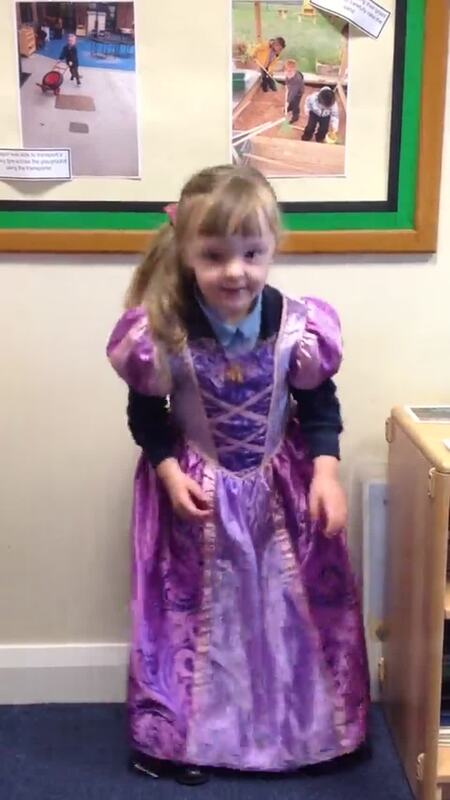 As it is the first week in December children are enjoying exploring the Christmas fancy dress clothes. There is some fantastic speaking and listening happening as children share their Christmas experiences with each other. The children are practising speaking in full sentences and sticking to a main theme when speaking. 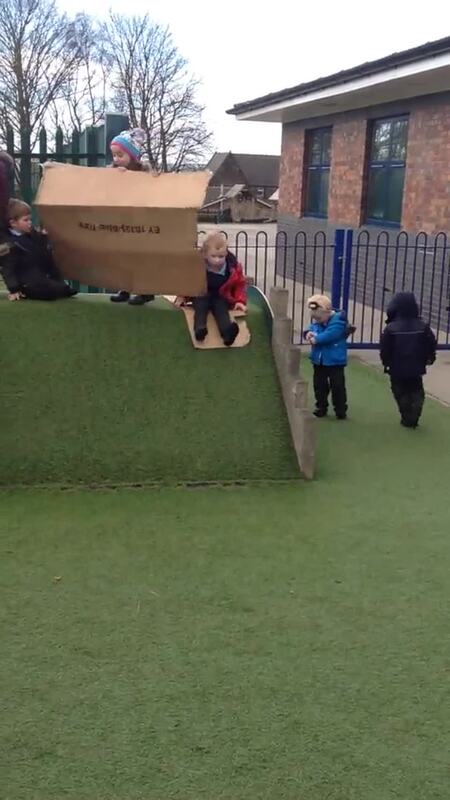 The children in the morning session have been creating their own structures using the crates, blocks and other resources available in the outdoor area. 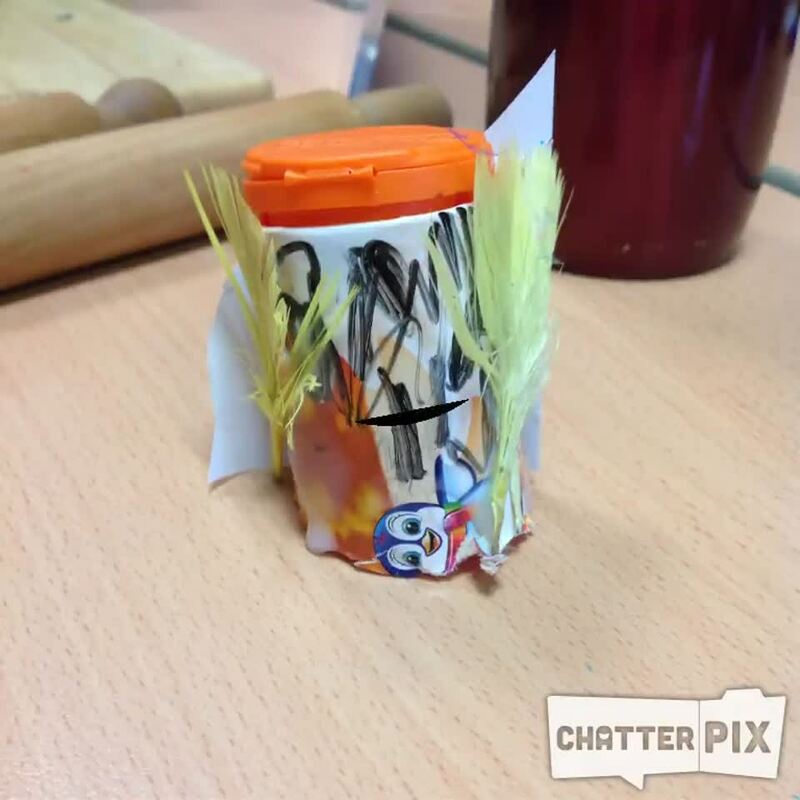 Take a look at this boat made by Charles, Arlo and Scarlett. We have been practising retelling our new story 'The Odd Egg'. Can you retell this story at home? Do you know any other animals that come from eggs? On Friday we came to school in non uniform to help raise money for Children in Need. During the session we made our own Pudsey Bear ears to wear and painted pictures of Pudsey Bear. We really enjoy playing and exploring in our outdoor area. Here are some photographs from this week. This week we have been using the Numicon pegs to create patterns on a base board. We focused on creating the patterns for the Numicon shapes 1,2, and 3. We were careful to make sure we started at the bottom of the base board when making each pattern. Our story map is complete and displayed on our wall. 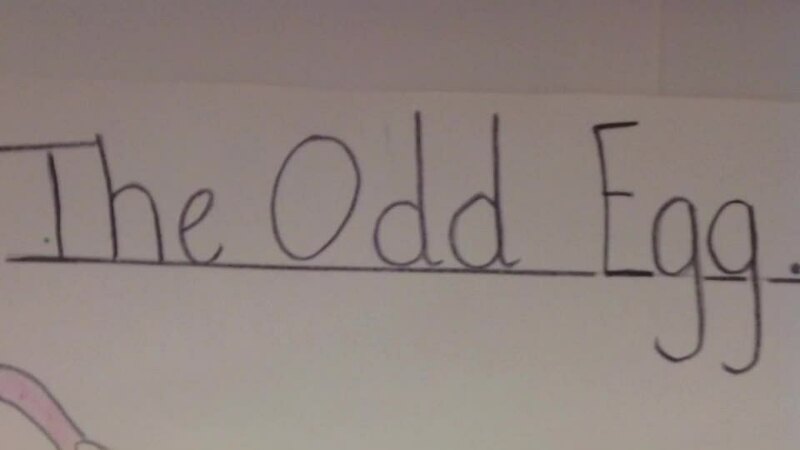 Can you retell the story 'The Odd Egg' at home? 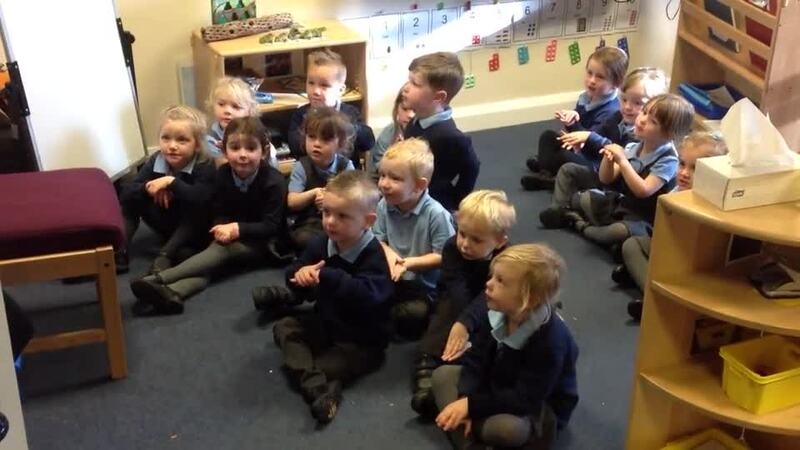 Today at 11:00am the children in nursery observed a 2 minutes silence for remembrance day. During this we watched the 2 minute short film called 'Poppies' by Cbeebies. On Monday when we were learning about bonfire night, the children in nursery were unsure what 'parkin' was. Today Mrs Travis brought in some parkin cake for all the children to try. Some children liked the parkin and some children did not, but everybody tried it which made Mrs Travis very proud. This week we have been talking about poppies and why people are wearing poppies around us. 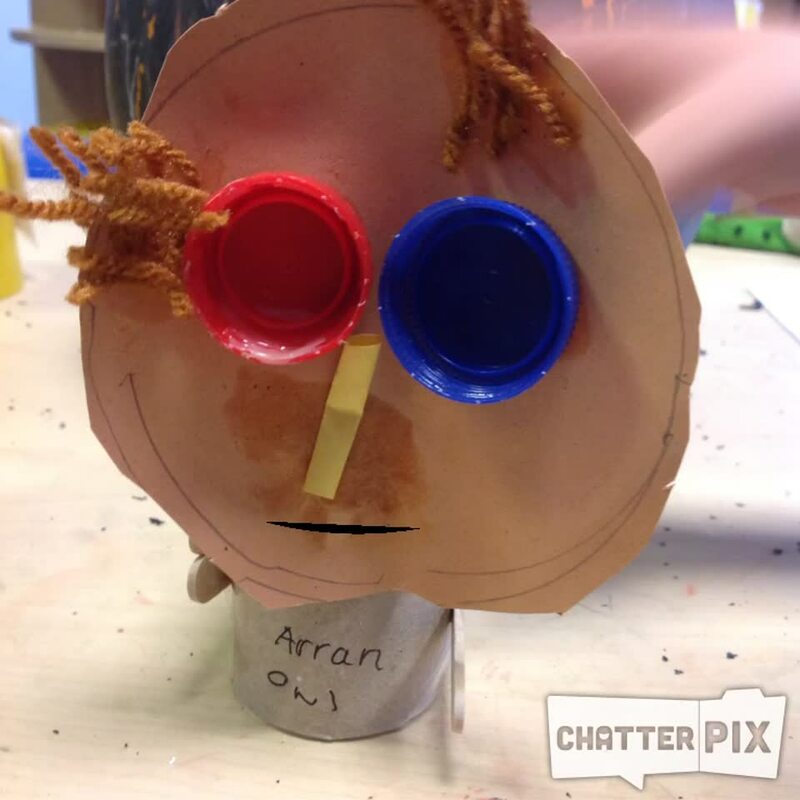 "It's to remember all the men who died to save our country" explained Arran. All the children then painted their own poppy ready to display in nursery. We have had great fun creating firework pictures using scrubbing brushes in paint and glitter! 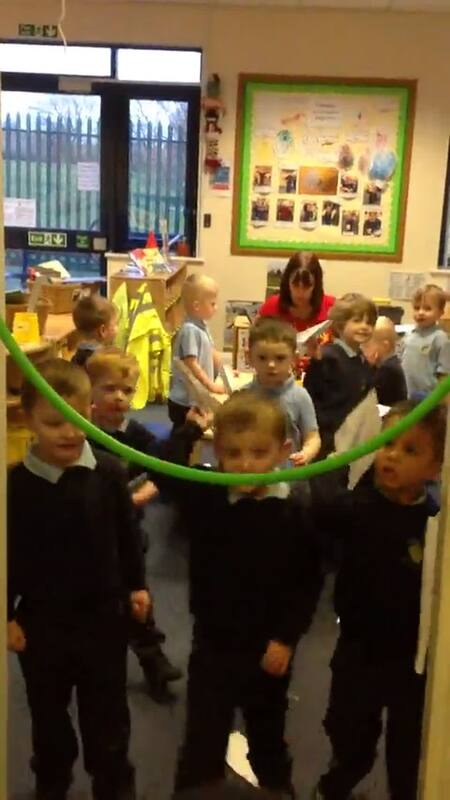 This half term the children in nursery have enjoyed using a story map to retell the story 'Dear Zoo' by Rod Campbell. The key story for Nursery in Autumn term 2 (November to December 2018) is 'The Odd Egg' By Emily Gravett. Our maths learning wall is now complete for Autumn term 1. We have been introduced to the Numicon shapes 1 - 10 and used them in a range of different activities. We took turns when pulling out Numicon shapes from a bag and then matching them to a number line. We worked in pairs with the Numicon spinners, spinning a Numicon shape then finding the corresponding shape. We explored different ways of filling a Numicon base board. We have also started to look at basic 2d shapes. We have been working on our listening skills this week by listening to the different growls of the three bears. We had to listen carefully to work out which bear was growling. Once we had listened to the bears growl we had had a go at copying each growl. Can you growl like Daddy Bear? Can you growl like Mummy Bear? Can you growl like Baby Bear? Ask a family member if they can tell which bear's growl you are making. This week we are exploring autumn colours. We have used our hands to mix the colours red and yellow to see what happens. 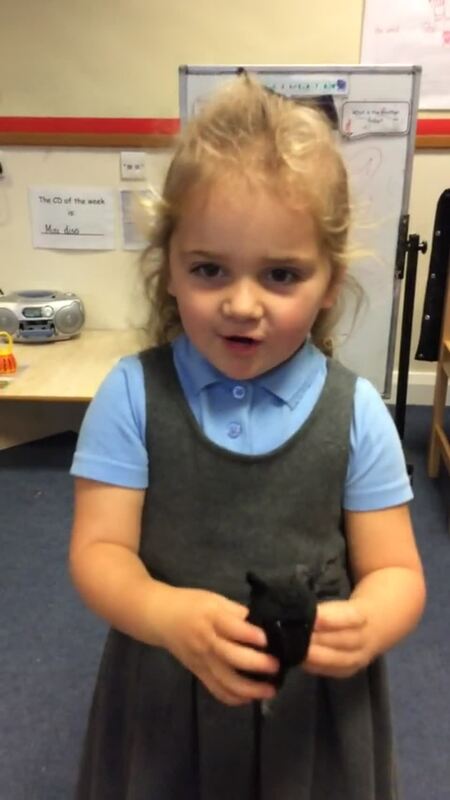 This week the play dough is getting a bit spooky, the dough is black and some children have been making play dough spiders. Do you know how many legs a spider has? Do you know a rhyme about a spider? 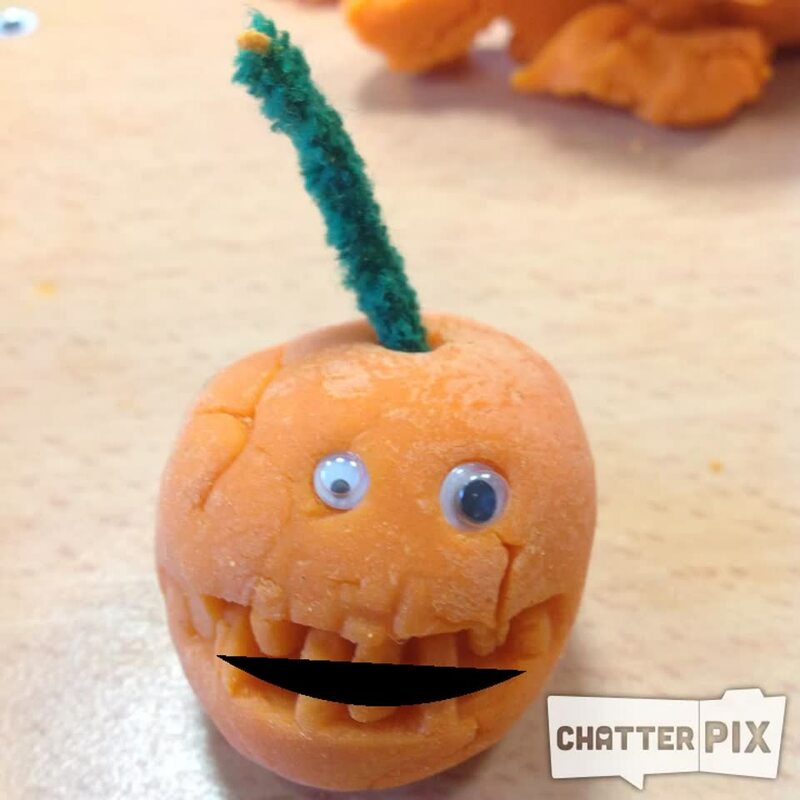 This week we are using both our fine and gross motor skills to hammer golf tees into pumpkins. We are also working on our hand-eye co-ordination as we are careful not to hit our fingers. 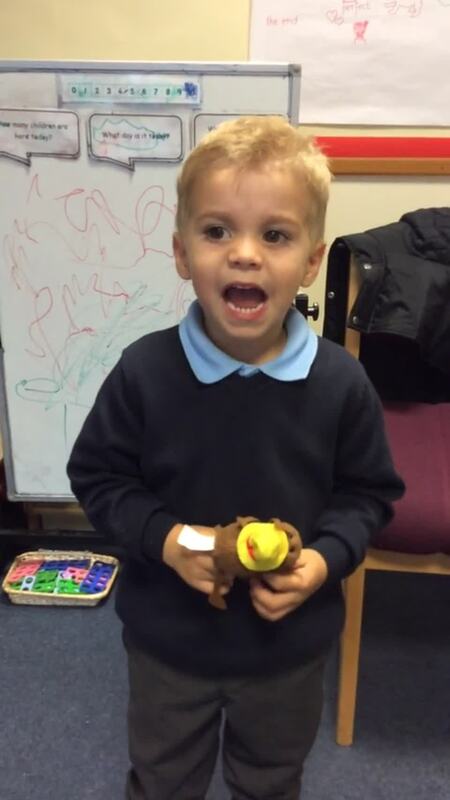 This morning in nursery, Jacob taught us his favourite rhyme that he sings at home with his family. The rhyme is called 'Tiny Tim' Jacob also showed us the actions to the rhyme. Can you sing this song at home ? Can you remember the actions? 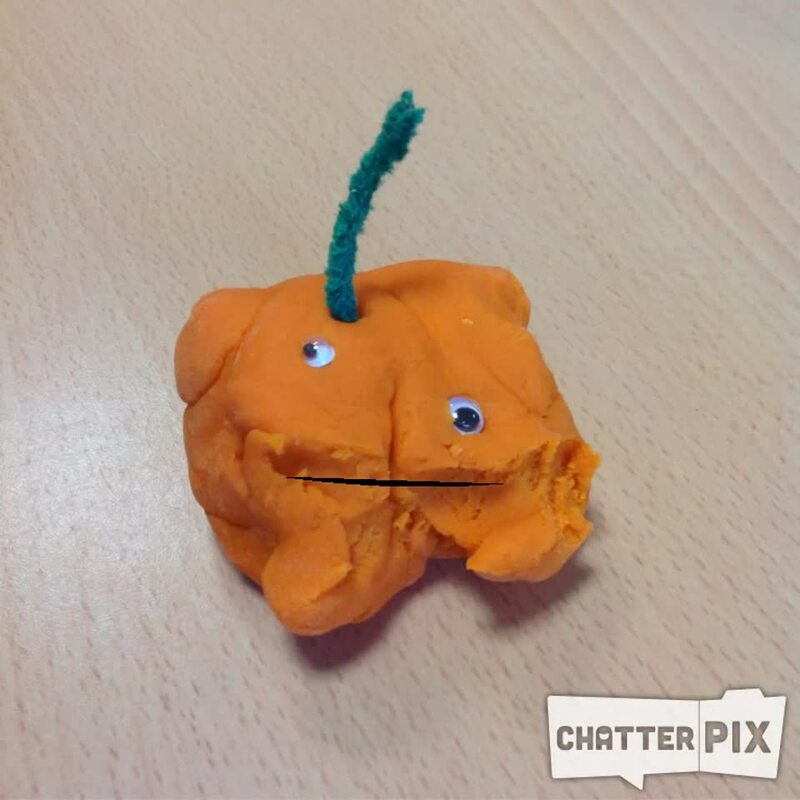 In the dough this week we are making pumpkins. 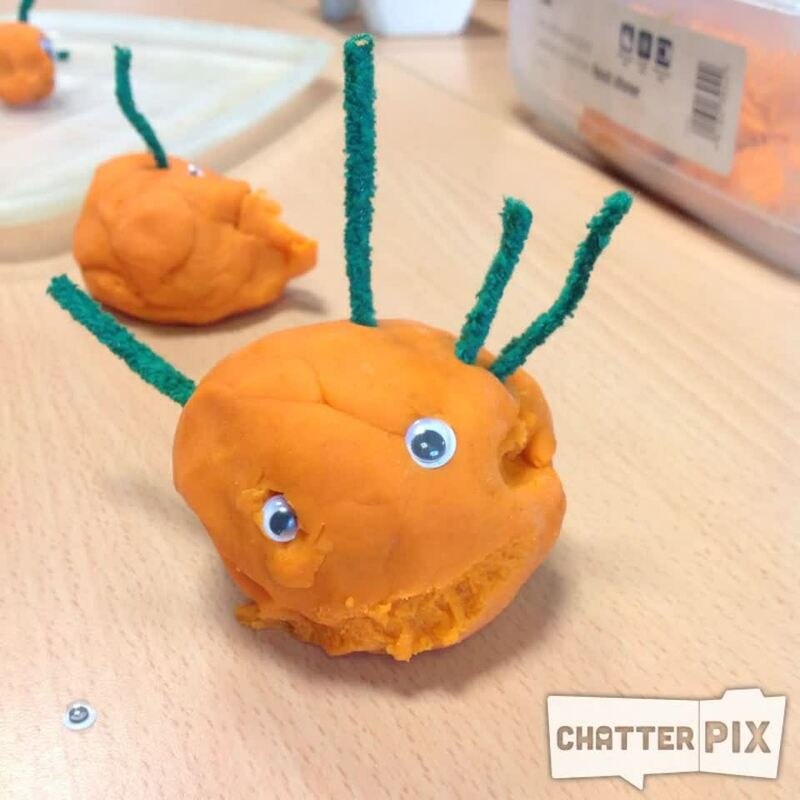 We are using orange play dough which we are practising rolling into a ball using both hands (this can sometimes be quite tricky). 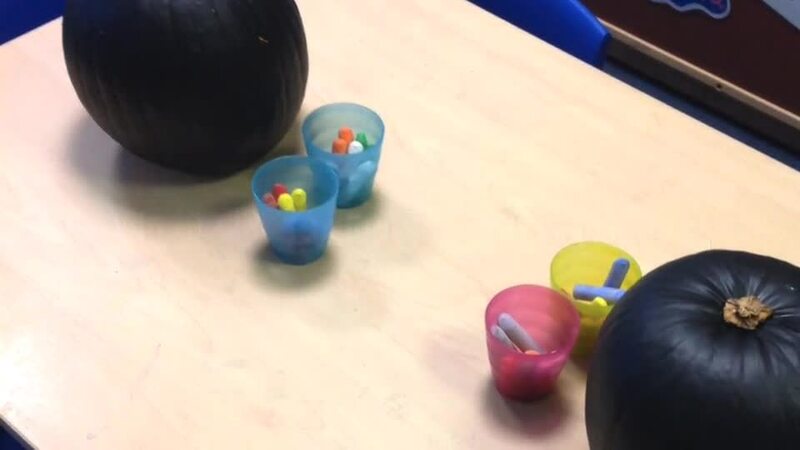 Today in nursery we have enjoyed chalking on pumpkins! In nursery we are using the I pads to make our models come alive! Look at our roarsome Dragons! Last week we looked at filling the Numicon base board by choosing Numicon shapes from the box. We has to look carefully to see which Numicon shapes would fit it each gap. Some children chose to use the larger shapes to fill their board quicker, and others chose to use smaller Numicon shapes and lots of Numicon one shapes. 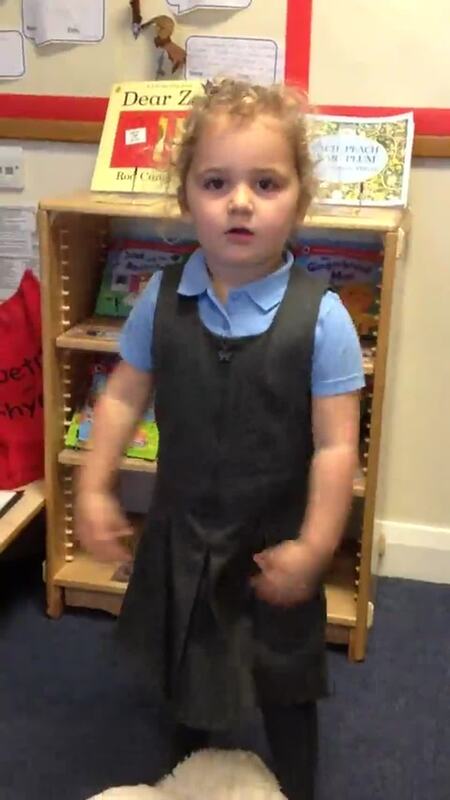 We sing familiar nursery rhymes every day in nursery. 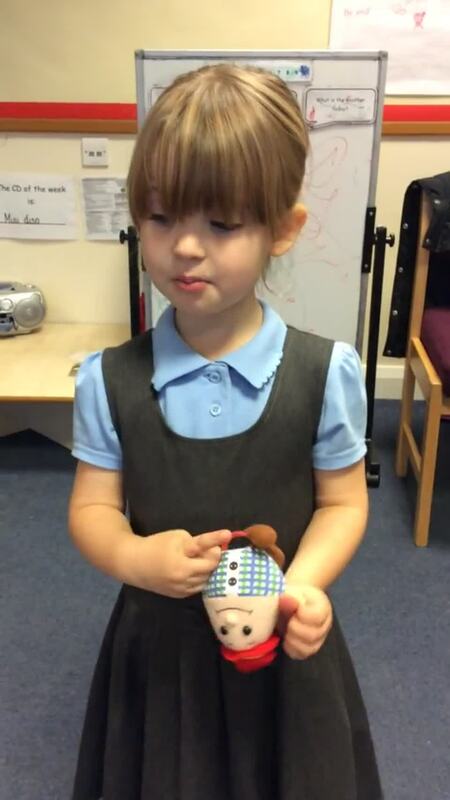 Singing and reciting nursery rhymes is important to help us develop literacy and communication skills. It is fun too! Can you sing these nursery rhymes aloud at home with your family? Do you know any other nursery rhymes? 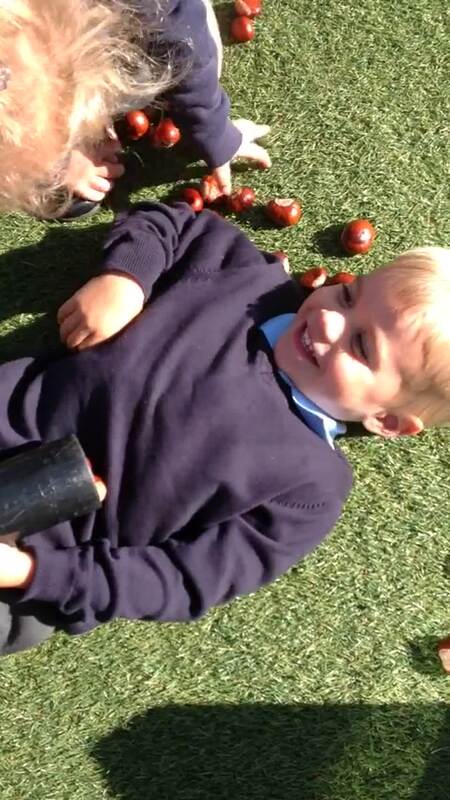 Lots of nursery children have noticed that there are conkers on the floor and have had fun collecting them. 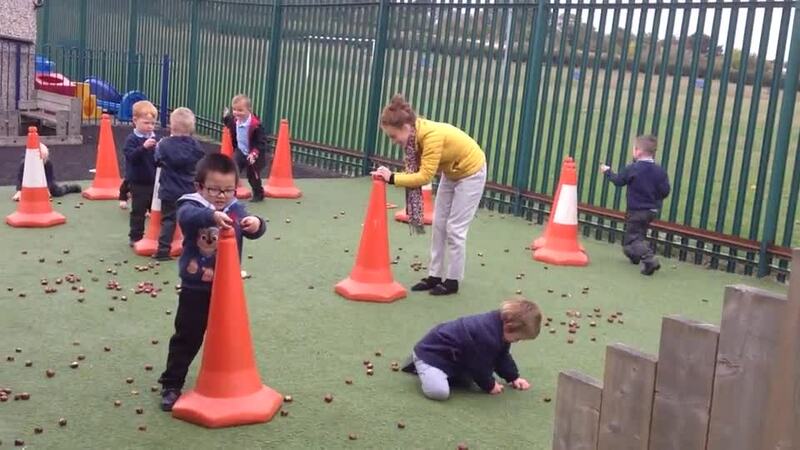 In nursery we explored conkers across our continuous provision. In the water we discovered that some conkers sink and some conkers float. 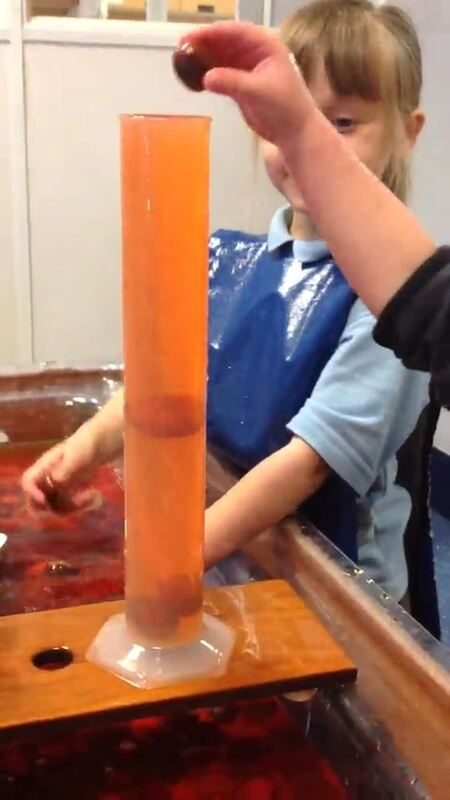 All the conkers would fit in our large and medium sized measuring cylinder, but only the small conkers would fit into the smallest measuring cylinder, some even got stuck! We inspected different conkers, looking at the colours we could see on both the outside and the inside of the conker. 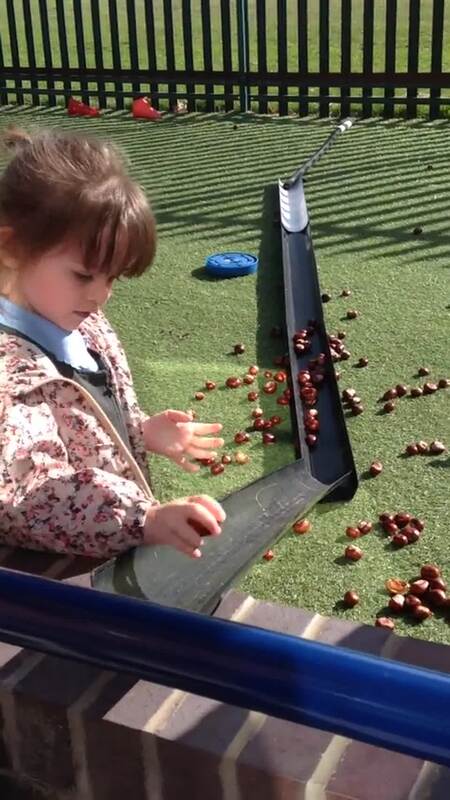 In the outdoor area we enjoyed making ramps to roll the conkers down, the morning children worked with the foundation stage 2 children to create a 'conker conga' on the floor. In the afternoon the conkers were everywhere! So we invented a fun game to help us collect all the conkers up again. Each child had a large road cone, we worked as fast as we could to collect as many conkers as we could and post them into our cone. When all the conkers had been collected we each lifted up our cones to reveal the amount of conkers we had managed to collect. We are using ICT software to learn the names of 2d shapes. Which 2d shapes do you know? Can you find any 2d shapes around you? Today we have been working on our cutting skills. We practised snipping art straws and cutting paper. We also learnt how to hold and use scissors safely. As the weather is becoming very wet, we are getting lots of opportunities to practise being independent. We are practising taking off our own shoes and putting on our wet suits and wellington boots. 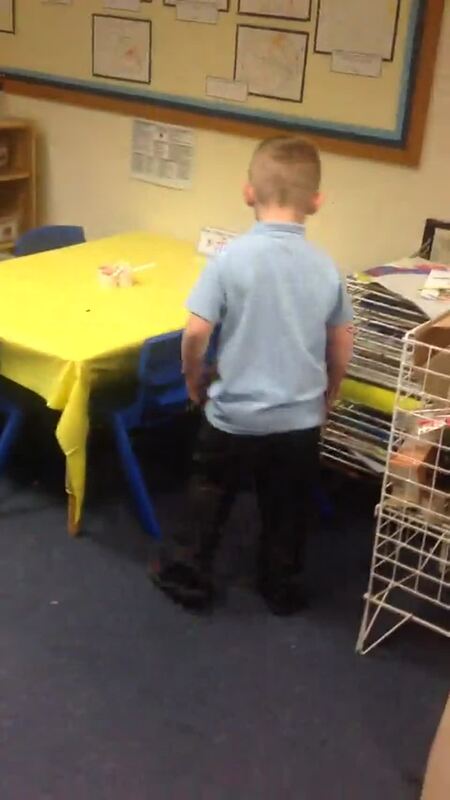 When we take off our shoes we carefully peg them together so we do not loose them. After we have had fun outside we need to independently take off our wellington boots, then take off our wet suits and hang them up to dry. We are learning to recognise our own school shoes and put them on, then we carefully peg our wellington boots back together again and place them under the coat pegs. You can help your child at home by encouraging them to be independent in getting dressed and putting on their shoes. This week we have been looking at finding and matching Numicon shapes. We took turns to spin a Numicon spinner, then we had to find the corresponding Numicon shape from the box. We discussed the size and colour and introduced the names of each Numicon shape that was spun. Today we used the story structure from 'Dear Zoo' by Rod Campbell, and changed the animals to create our own story called 'Dear Zoo'. We had to think about whether we wanted to keep each animal or send it back. This afternoon was a big soggy as the rain was quite torrential. We had to get our wet suits and wellington boots on before we went out to play! We found puddles to splash in and painted on the floor using powder paints. Do you know any songs about rain? 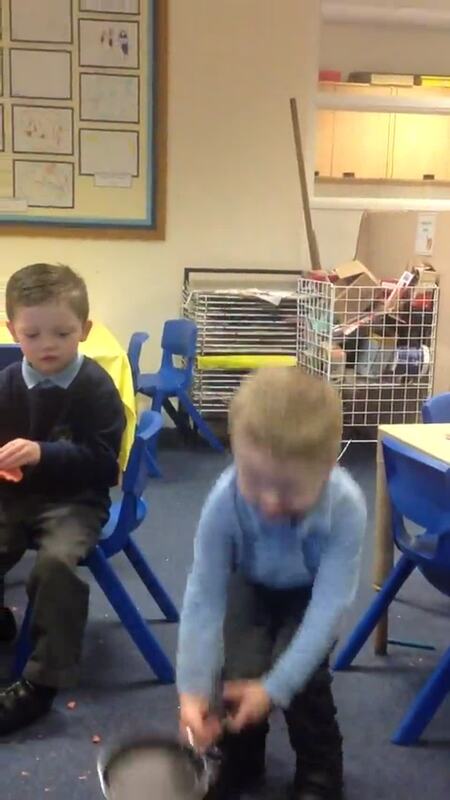 Today the children in nursery were building up strength in their hands and fingers by painting using spray bottles. It was quite messy but very fun! Today we have been retelling the story 'Dear Zoo' using our story map. 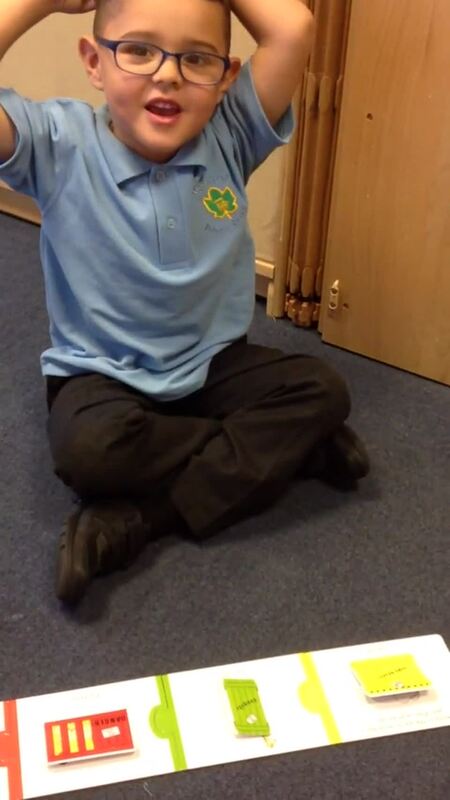 We learnt the Makaton actions for each animal and used them in our story. 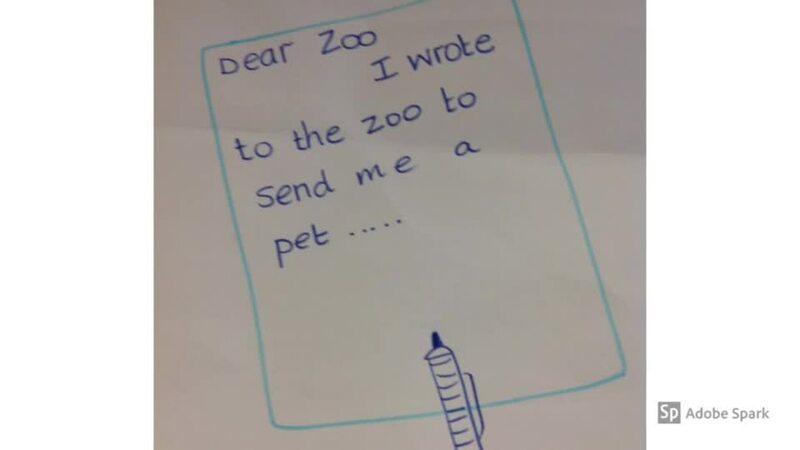 Can you retell the story 'Dear Zoo' at home using this story map? Can you remember the Makaton signs for each animal? Today Scarlett brought a box of apples into nursery. 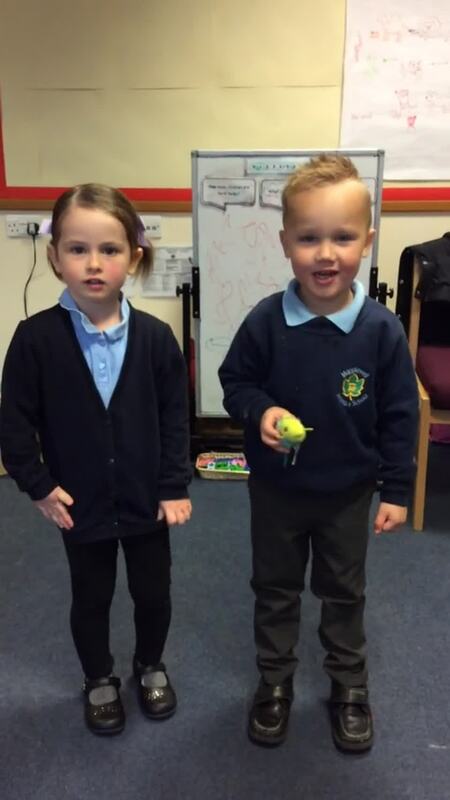 The rest of the class thought that Scarlett had bought the apples from the Co-Op, but Scarlett explained that the apples were from her apple tree in her garden. Scarlett continued to tell us that she had to climb up a ladder to pick the apples because the apple tree is very high. We talked about the colour of the apples and how the stalk is where it was attached to the tree. On the computer we looked at photographs of apple trees and different types of apple. We discussed what might be inside an apple if we cut it in half. 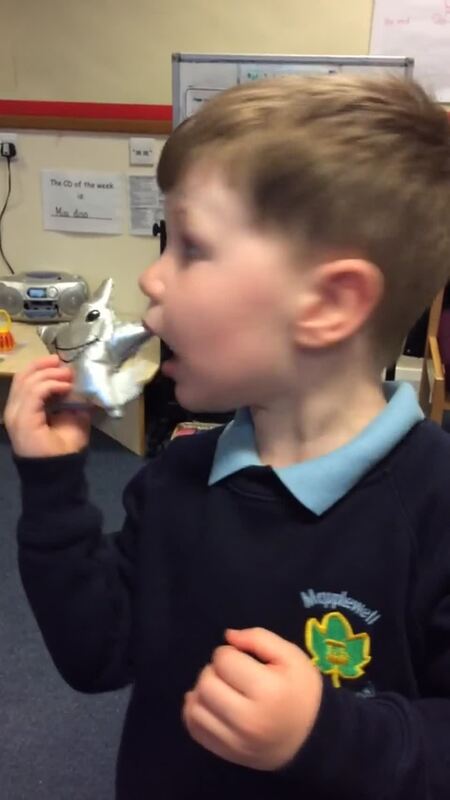 Some children thought that a dinosaur might be inside, others suggested sausages and nuts. There was only one way to find out so Mrs Bailey very carefully cut an apple in half, and inside the apple was white and there were some small brown pips. "A seed it would grow" said Arlo. 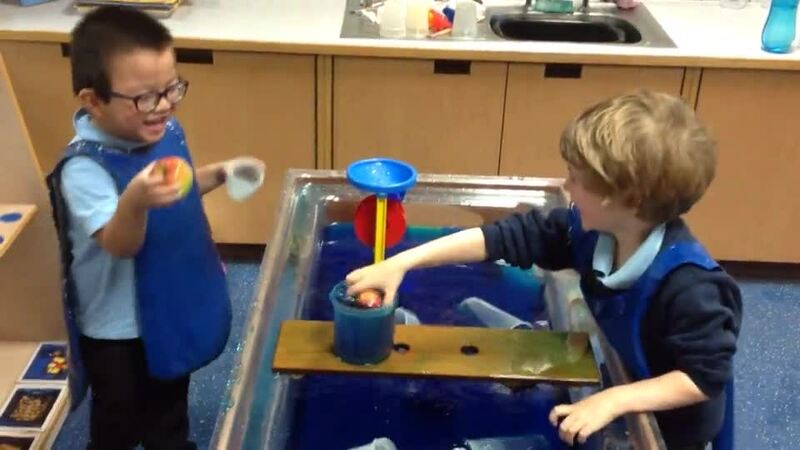 In the environment we explored apples in the water tray and discovered that they float! We also made pictures using apples and paint. Finally we chopped some (fresh) apples up and ate them! Thank you Scarlett for inspiring our apple day! This week in maths we been looking at the Numicon shapes 1 to 10. We looked at the shapes on the table which were placed in order from 1 to 10. We discussed which Numicon shape was the smallest and which Numicon shape was the largest. Then we closed our eyes and picked a Numicon shape out of a bag before matching it up to the identical Numicon shape in the number line. We discussed the colour and size of each Numicon shape. Today Etta kindly brought in her Dear Zoo jigsaw from home. We enjoyed working together to complete the jigsaw and use it to help us retell the story to each other. 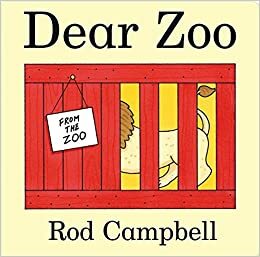 This week we have been reading the story 'Dear Zoo' by Rod Campbell. 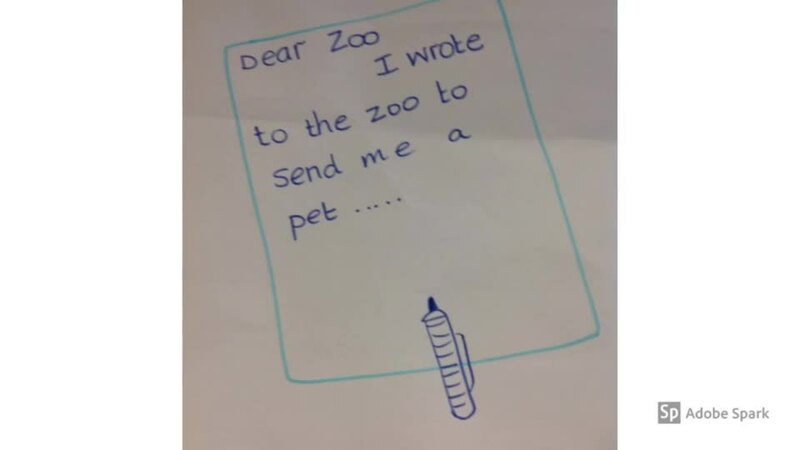 We then thought about what pets we would like from the zoo. "A frog, a dog and a spider and a sheep" said Etta. 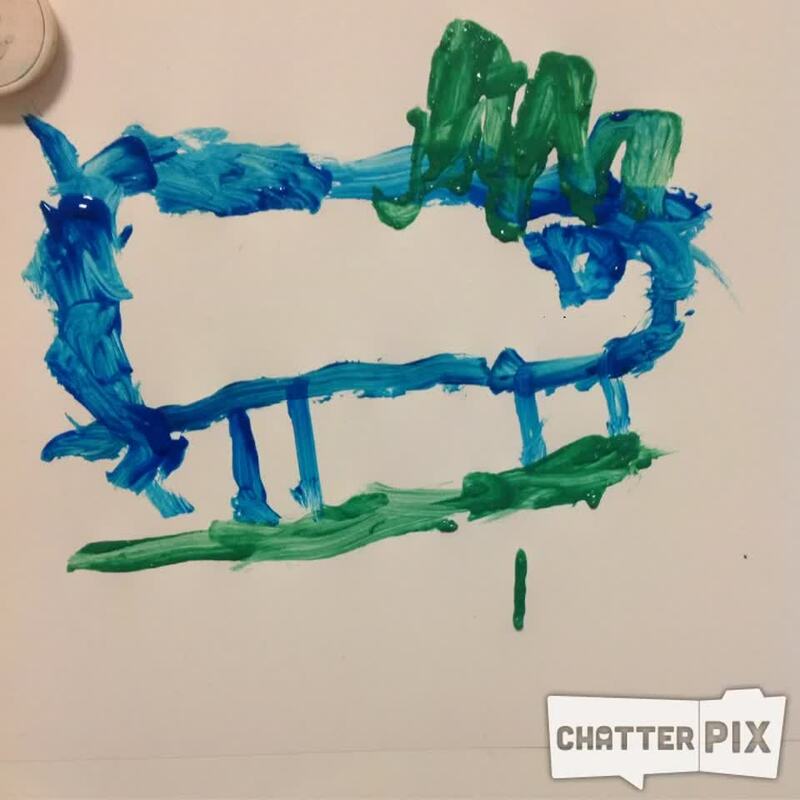 "A green frog that goes in the water, a cat that goes meow, a chicken, and elephant and a chicken" - Francine. 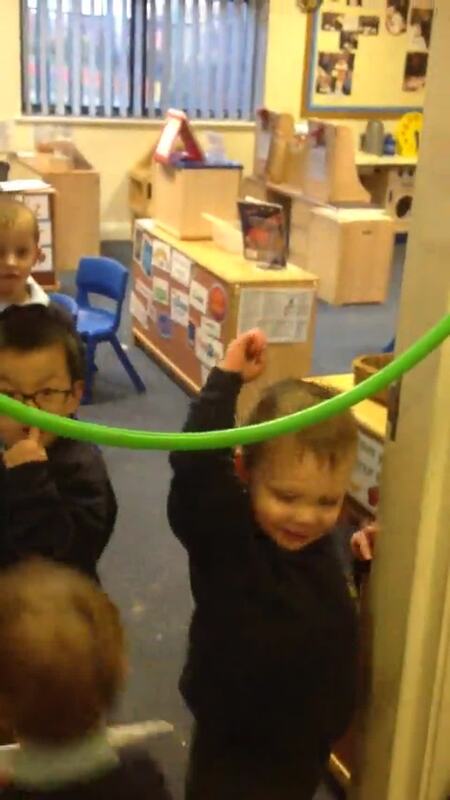 It was wonderful to see all our older children return to nursery with big smiles on their faces today. We discussed our new class name, and after reading the story Zog by Julia Donaldson we roared like a dragon as loud as we could, it was pretty scary! 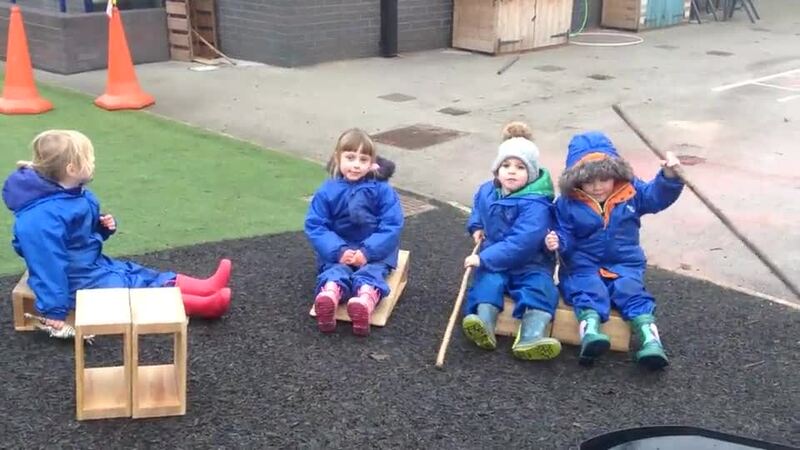 It was then time to explore the provision in our new nursery classroom, the children showed confidence and excellent communication skills as they initiated conversations and play situations with their friends. Tomorrow we are all excited to begin welcoming new children into nursery and making lots of new friends.